This contest is for a Chance Adams 2019 Topps Gypsy Queen RC Auto. Good luck!!! This contest will end Friday, April 19, 2019 @ 8:00 p.m. EST. Chris Getz? Who the heck is this guy? Getz was in the majors from 2008 to 2014. He played for the White Sox, Royals, and Blue Jays. Now he’s the Director of Player Development for the White Sox. This contest is for a Chris Getz 2008 Bowman Sterling RC Auto. Good luck!!! This contest will end Friday, April 12, 2019 @ 8:00 p.m. EST. Michael Jack Schmidt will go down in history as one of the greatest third baseman to ever play the game. He is definitely the best third baseman to ever wear a Phillies uniform. I enjoy listening to him talk with the rest of the Phillies broadcast team on weekend home games. If you’re in the market for a Mike Schmidt rookie card, look no further than 1973 Topps Baseball. 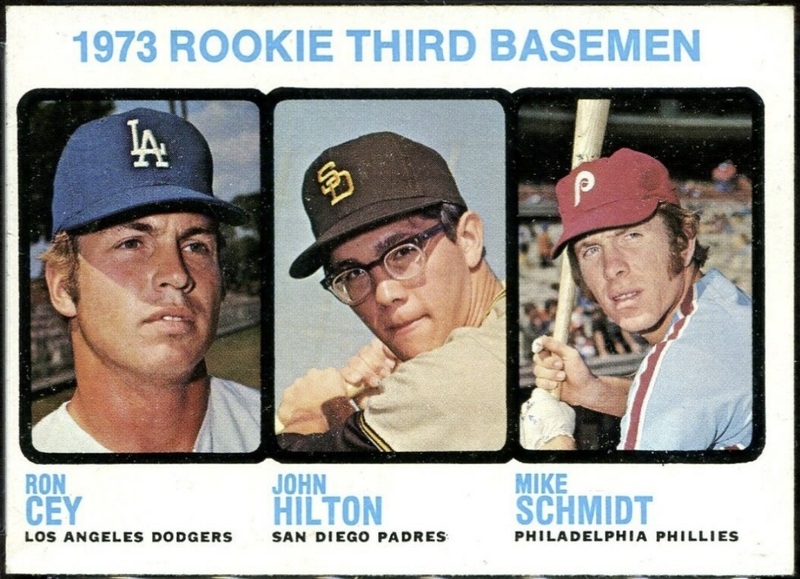 Its card #615 in the set, and he’s pictured along side John Hilton and Ron Cey. This card, and it’s Canadian printed O-Pee-Chee counterpart, are his only recognized rookies. One of these days I plan to own a Schmidt rookie. They’re readily available. I just haven’t pulled the trigger yet. I’d like to own a PSA 5, 6, or 7 example. Cards graded higher start to get expensive. Pictured below is a small group of Mike Schmidt rookie-era cards that are not officially recognized as true rookies. That doesn’t mean they’re worthless. In fact, most are very desirable. But authentic rookies they are NOT. My favorite one is the 1973 Topps Philadelphia Phillies Team Card #536. Since his real rookie card has more than one person on it, I guess some people like to think the team card counts too. Earlier this month it was announced by Tom Seaver’s family that he would be retiring from public life due to dementia. That’s a shame. For years he’s been a regular on the autograph circuit. This 12x All-Star pitcher and 1992 Baseball Hall of Fame inductee will be greatly missed. Thanks Tom Terrific! Whenever I hear Tom Seaver’s name, I always think back to the first National Sports Collectors Convention that I attended in 2007. While I was there, I pulled a Tom Seaver/Dwight Gooden/Roger Clemens Triple Auto Relic #’ed 1/1 from a pack of ’07 Triple Threads. Tom Seaver has a ton of cards. Autographs and relics of him are all over the place. His one true rookie card comes from the 1967 Topps Baseball set. Its card #581, and he is pictured along side fellow Mets pitcher Bill Denehy. Along with Mickey Mantle and the Rod Carew rookie, its one of the most sought after cards in the set. 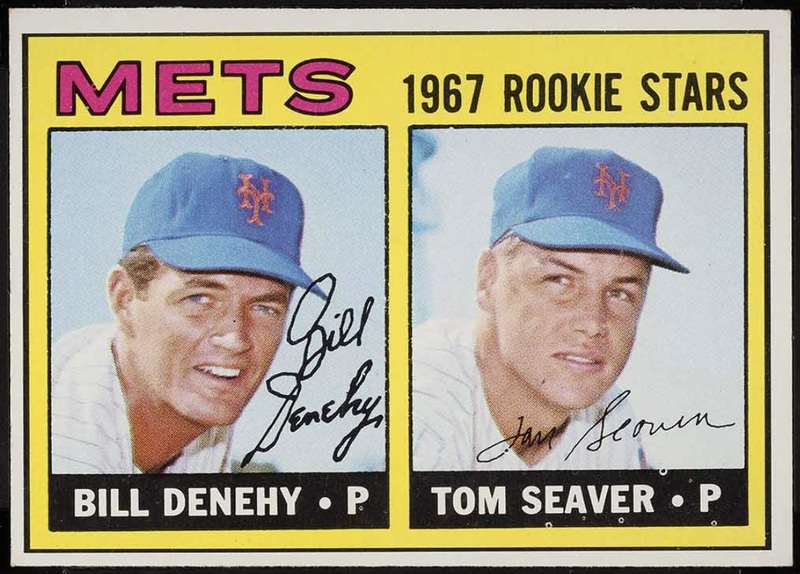 There are five Tom Seaver cards from that era which could easily be mistaken for his actual rookie. 1968 Topps All-Star Rookie #45 – Whenever that All-Star Rookie trophy shows up I sometimes think people believe its an actual rookie card. In most cases, the player was a rookie the year before. 1968 O-Pee-Chee All-Star Rookie #45 – The same info from the ‘68 Topps applies, except this card was printed in Canada. 1968 Topps All-Star Rookie Milton Bradley #45 – The same info from the ’68 Topps applies, except the back of this card has a brighter color yellow. Its part of a Milton Bradley board game called “Win A Card”. 1968 Topps All-Star Rookie Venezuelan #45 – The same info from the ’68 Topps applies. This set was released in South America. The cards were printed on gray stock, and have an orange tint. Most of the cards say “Hecho en Venezulela – C. A. Litoven” on the back. Tom Seaver’s card does not. A big pet peeve of mine is when people refer to certain authentic cards as an athlete’s rookie card when in fact they’re NOT. This happens all the time. Some athletes are more prone to it than others. One of the biggest, if not the biggest, athlete this applies to is Yankees slugger Mickey Mantle. 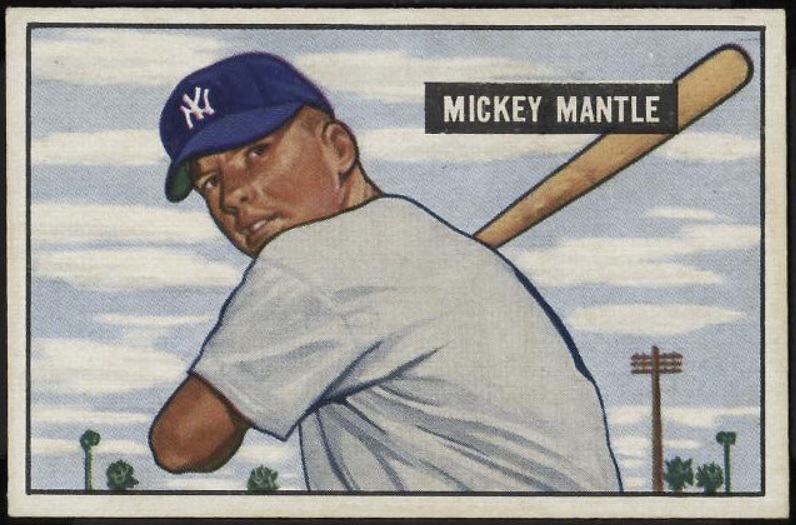 I know this may sound like common knowledge for most of us, but Mickey Mantle only has one rookie card. Its card #253 in the 1951 Bowman Baseball set. That’s it. His one and only true rookie card. No debate needed. Countless reprints have been made over the decades. But that isn’t what bothers me. Three items from that era are constantly being called rookies, but truly aren’t. Mickey Mantle’s 1952 Berk Ross card uses the same photograph found on his ’51 Bowman rookie. Although there are some differences between the two, one could easily be mistaken for another. 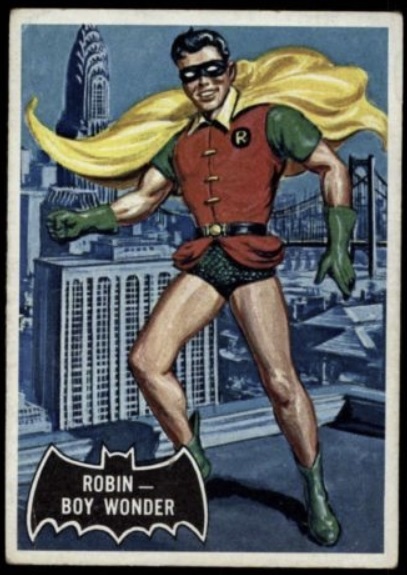 The 1952 Berk Ross set consists of (72) cards. I’ve never been a big fan of this set because the images are fuzzy and of poor quality. Can you believe thousands of these 1952 Topps High Numbers cards were just tossed away in the ocean? It happened. They were part of a stash of old inventory that nobody wanted, and Topps dumped them. You regularly see this classic called Mickey Mantle’s rookie. Its his first Topps card, but a rookie it is not. Technically not a card, this Mickey Mantle photograph is part of a Wheaties promotional set from 1951. The promotion was not widely done, and did not receive the best feedback. Still not a rookie card though. Autograph collectors know all about Lynn Swann. This Pittsburgh Steelers great, and Pro Football Hall of Famer isn’t the easiest person to obtain an autograph from. If you’re lucky enough to attend a signing where he’s scheduled to appear, its going to cost you quite a bit. Anywhere between $200-$300 to be exact. There’s also a good chance that whatever you plan to get signed has to adhere to his regulations. For example, Lynn Swann is scheduled to sign autographs at the next Chantilly Show. He will only do HOF or SB MVP inscriptions. He won’t sign personalizations or take photo op’s. Trading cards, Goal Line Art cards, unlicensed jerseys, and signing directly on the jersey number are out of the question. Its probably easier to list what he will sign versus won’t. You need a Ph.D. to get his autograph. I know some other athletes can be like this, but Lynn Swann is one of the worst. Cards of Lynn Swann are scarce too depending on what you’re looking for. His autograph isn’t the only thing he’s protective of. 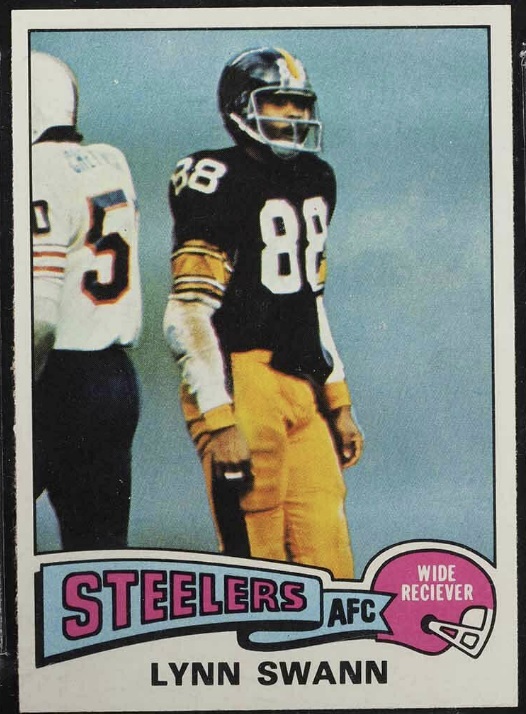 The official Lynn Swann rookie can be found in the 1975 Topps Football set. Its card #282. That’s not his only card in the set though. A 9-card Highlights subset exists. #459 is of Lynn Swann. Don’t let anyone convince you that his Highlights card is also a rookie. 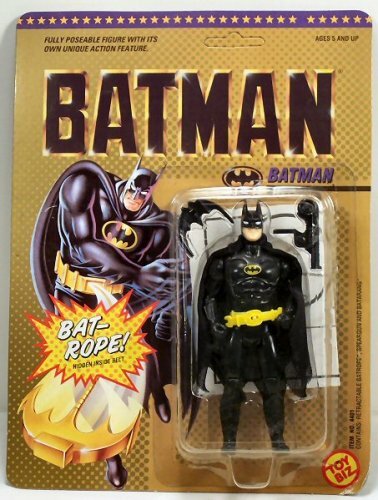 It certainly isn’t recognized as one, and doesn’t carry anywhere near as much value. I see many people attempting to pass this card off as his true rookie. That simply isn’t the case.